We catch them with our teeth. 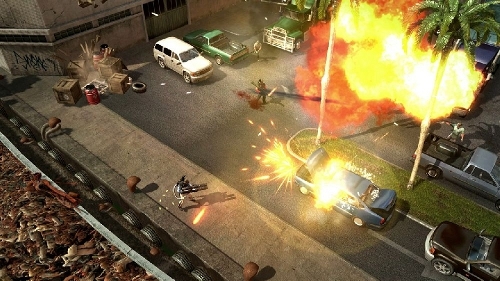 A fistful of new images from Narco Terror just arrived via an unmarked box thrown out the window of a black sedan. Deep Silver and Rubicon Orgnization's upcoming twin stick shooter is all about guns, drug cartels, kidnappings, explosions, and cheesy 80s action tropes. In short: blinding amounts of adrenaline and fun. And the new screenshots aren't afraid to show it. Announced back in May, Narco Terror is everything that made action movies and TV shows in the 70s-80s so blindingly awesome. There's an almost complete lack of concern for things like continuity, realism, physics, social issues and all those other touchy-feely subjects we worry about today. It's guns and explosions, people. Probably some really cool sunglasses and hairdos, too. If video games weren't made for a little wanton destruction, we don't know why they're around. 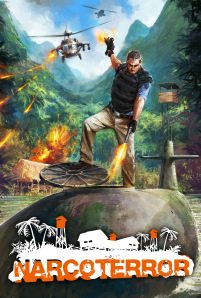 Narco Terror is scheduled for release on Xbox LIVE Marketplace, PlayStation Store and Steam this summer. Be there, or Rick's gonna come find you. Page created in 1.4098 seconds.